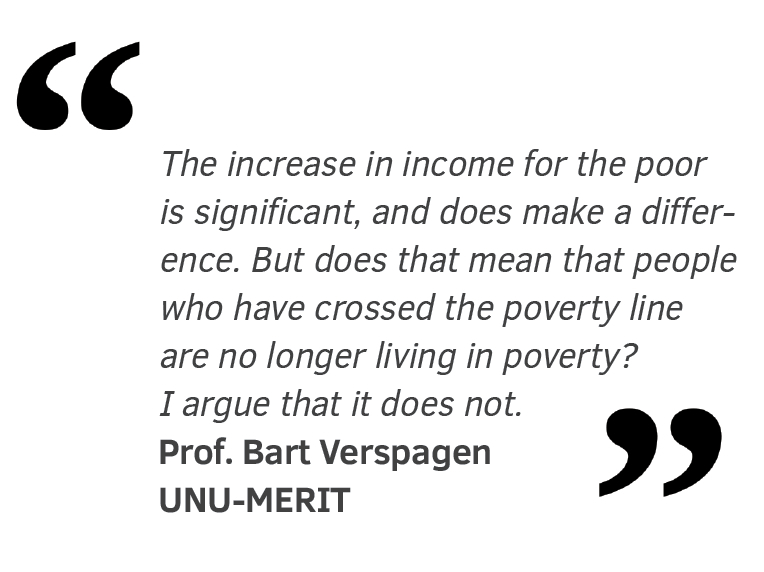 UNU-MERIT » What Lies Beyond the Poverty Line: Real Hope or Harsh Reality? What Lies Beyond the Poverty Line: Real Hope or Harsh Reality? Reports on the fight against global poverty are often optimistic — sometimes too optimistic. Part of the problem is “our” reliance on a simplistic measure, which draws an absolute poverty line of $1.90 per day in so-called 2011 international purchasing power parity. What can we do differently and where should we draw the line in our attempts to eradicate extreme poverty? The leading international source on poverty statistics, the World Bank, has many sophisticated measures available, but it is customary to define an individual who has less than $1.90 per day available for consumption as “extremely poor” and to not count anyone above that level in the poverty statistics. Thus, the Economist on 1 June 2013 felt able to conclude that “[n]early 1 billion people have been taken out of extreme poverty in 20 years,” while Wikipedia refers to a “halving” of the extreme poverty rate between 1990 and 2011. When based on such a simple statistic, are these bold conclusions still valid? If an individual passes from $1.89 to $1.91 is he no longer extremely poor? 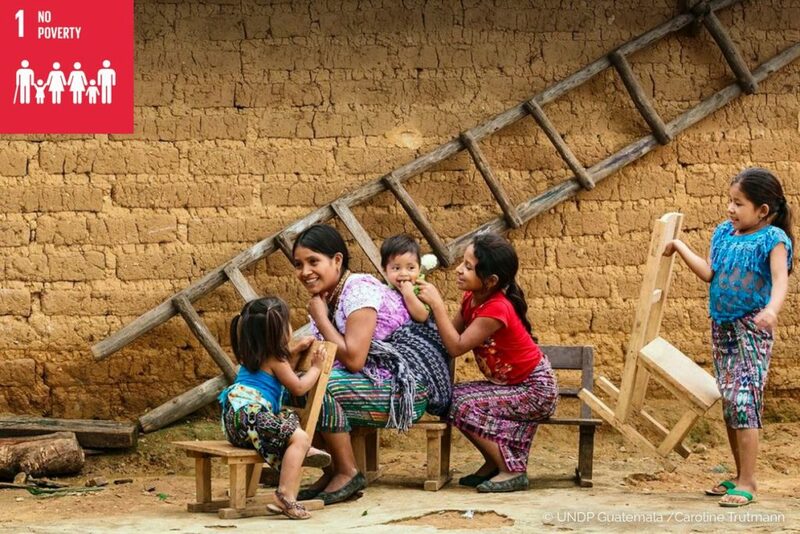 We can learn a great deal more about (extreme) poverty using the excellent PovcalNet website powered by the World Bank. From this website, I collected data on the global distribution of income for the period 1981 – 2013. For each of the available years, I gathered data on the so-called percentiles of the distribution. This means that from the full underlying microeconomic detail, I have data on 99 representative individuals that are at the borderline between the 1% poorest and 99% richest, the 2% poorest and 98% richest, up to the 99% poorest and 1% richest individuals (the 100th individual would be the richest individual in the world, which is not a very informative category). The underlying distribution is for consumption expenditures per day, which is the number used in the definition of extreme poverty. Before we look at some of these data, it is useful to reflect on how the $1.90 per day number was chosen. It is based on the costs needed to buy a daily diet of 2100 calories, plus a fixed markup for essential non-food expenditures. The food costs (2100 calories) are about 60-70% of the total (i.e. about $1.15 – $1.35), the remainder ($0.75 – $0.55) is a guesstimate for what poor people in poor countries actually spend. The sum total of $1.90 is taken to be universally valid across countries and time periods, because it is measured in so-called international purchasing power parity dollars, which means that we convert actual expenditures to the prices of a given year (2011) and an international reference country. Because prices differ between countries and time periods, the $1.90 does not always match the perception that people have about prices in their own environment. For example, for the $1.90 to match the prices and currency (€) in the Netherlands in 2015, one would have to multiply the amount by about 1.16, i.e., it would be about €2.21. However, for international comparison within the database that I will use, the $1.90 amount is perfect, because it enables us to compare individuals across countries and time periods. Rapid progress, but how much is enough? The basic data that I collected confirm the impression of rapid progress towards bringing individuals over the $1.90 amount. Of the 99 “individuals” in the database, 52 were below the $1.90 poverty line in 1981, and only 12 in 2013. But what happened to the 40 individuals (i.e. 40% of global population) that crossed the poverty line over this period? The figure below gives an answer to this question. 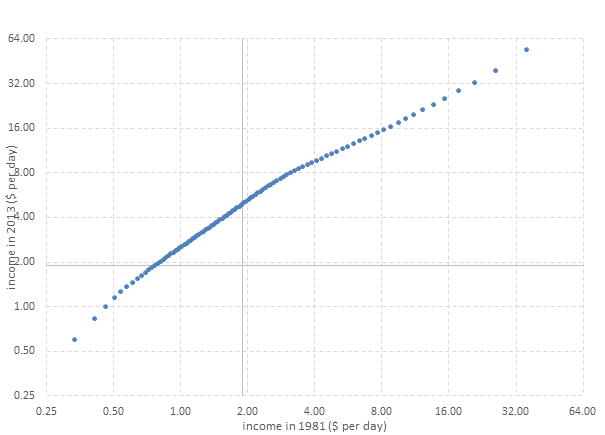 On the horizontal axis, we have income per day in 1981, on the vertical axis the same for 2013. The solid axes are at $1.90 per day, the extreme poverty line. Both axes are in a logarithmic scale. People who crossed the poverty line over this period are in the upper-left part of the graph (second quadrant). The richest among them, who was just below $1.90 in 1981, had $4.89 to spend in 2013 – an increase of about $3. The poorest among them, who was on just $1.90 in 2013, had $0.77 to spend in 1981 – an increase of about $1.20. Those below the poverty line in 1981 achieved an average annual proportionate growth rate of about 2.9%; for those above the poverty line in 1981, it was about 2.1%. Over the same period, global GDP grew at about 3.1%, according to the Conference Board’s Total Economy Database. The increase in income for the poor is significant, and does make a difference. But does that mean that people who have crossed the poverty line are no longer living in poverty? I argue that it does not. Of the 40 (out of 99) individuals that crossed the poverty line, 29 lived on less than double the poverty line (2 x $1.90 = $3.80) in 2013 — and twice the extreme poverty line is still very poor. Right now $1.90 (about €2.20 in current prices) is about the price that someone in my country would spend on a soft drink at the train station, or less than the price of a beer in a bar, and is about equal to the “service costs” of a theatre ticket bought online. All these are expenditures that most people living in developed countries don’t even think about making. But for the majority of those who crossed the poverty line in the period 1981–2013, this represents the entire amount that they can spend on a daily basis after they accounted for the absolute barest necessities in terms of food, clothing and shelter. So for these people, crossing the extreme poverty line did not mean that they were lifted out of poverty. The $1.90 a day measure is a difficult measure for people living in developed countries to relate to – because most of “us” only meet and interact with people living far above the poverty line. 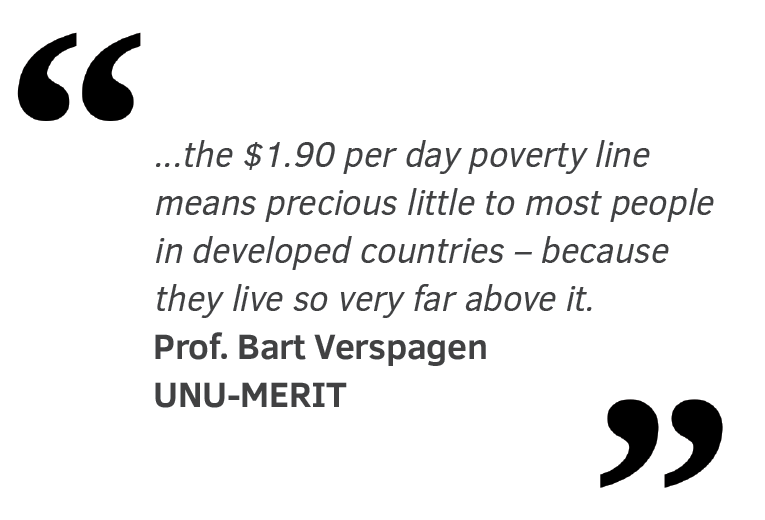 According to PovcalNet, in the Netherlands, the poorest of 99 individuals ranked according to the global income distribution, as used so far, lived on $11.90 in 2012 (the latest year available). In terms of the global income distribution of 2012, $11.90 corresponds to 83rd place in the distribution of 99 (the poorest being 1 and the richest 99). From a statistician’s point of view $1.90 per day may be a useful measure of extreme poverty, and the data collected by the World Bank in the database from which the number comes are extremely useful. However, the $1.90 per day poverty line means little to most people in developed countries – because they live so very far above it. It is very difficult to imagine what it means to cross that line and live just above it. Therefore, any conclusion about eradication of (extreme) poverty based on the $1.90 a day line must be seen as a typical “developed world” perspective: one that is largely irrelevant to those living in developing countries. Progress has been made in fighting poverty, but still not nearly enough has been done; so efforts must be continued and intensified. Bart Verspagen is Director of UNU-MERIT and Director-Dean of the Maastricht Graduate School of Governance (MGSoG) at Maastricht University. 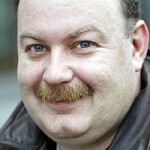 He is an economist specialised in the economics of technological change.